Shooting from the hip is hit and miss. In fact, it’s a lot more miss than hit. But when you hit you get photos from an angle you wouldn’t normally get without kneeling, which would be conspicuous, to say the least. 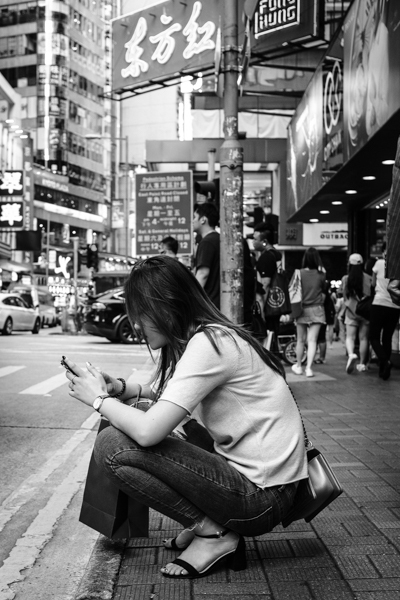 I have often talked and illustrated what I (and many others) call the Asian Crouch, this particular waiting posture that you see everywhere in China and in other parts of Asia also. I don’t know what people did when crouching before mobile phones existed, but I know what they do now… Incidentally, this is when I’m really glad I’ve worked on my hip shooting skills. The shot would be entirely different (and less effective in my opinion) at eye level. The Tai Hang Fire Dragon festival happens every year around the mid-autumn festival. Locals carry a long and sinuous Dragon body made of rope in which thousands of lit incense sticks have been planted through the streets of Tai Hang. This year I went to the festivities, and despite the massive crowd it was really great to witness it. 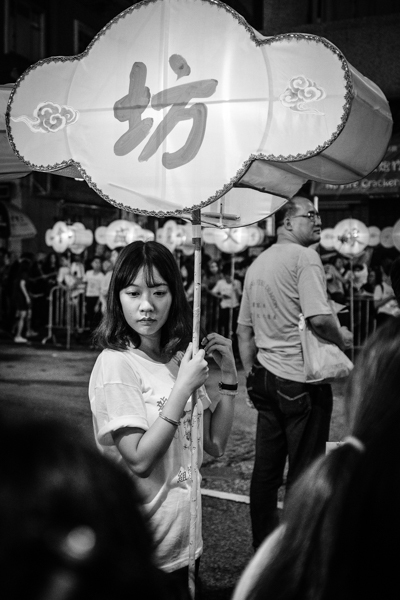 In the area where the Dragon was getting « refilled » with fresh incense, there was a cordon of lantern carrying volunteers to stop the crowd, and this girl’s expression in the light of the lanterns struck me. 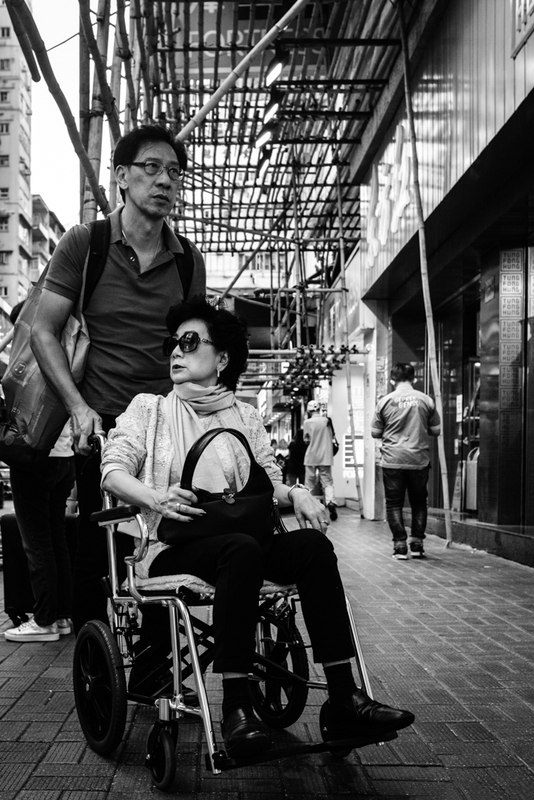 There’s a lot of outdoor life in Hong Kong, and a lot of street food. When I’m cruising for photos, I often try to find more than one person eating the same thing or doing the same thing. 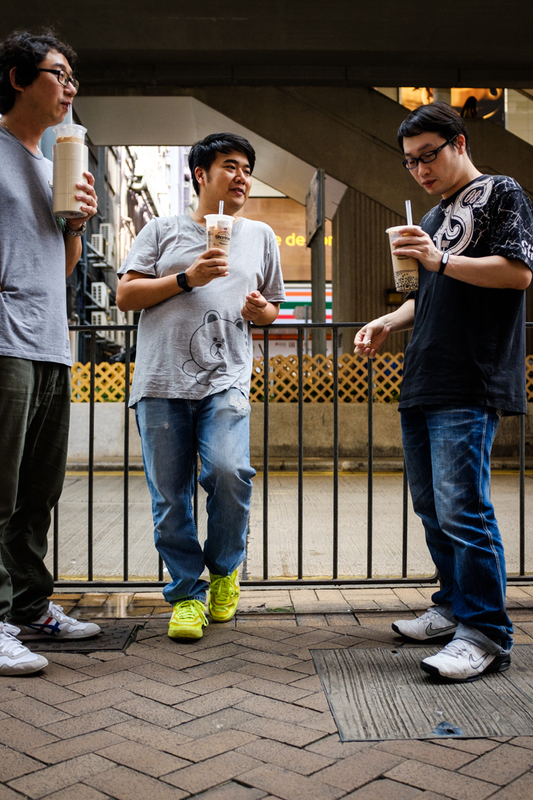 Here, I have three guys drinking gallons of milk tea. A lot more interesting than just one guy, don’t you think? 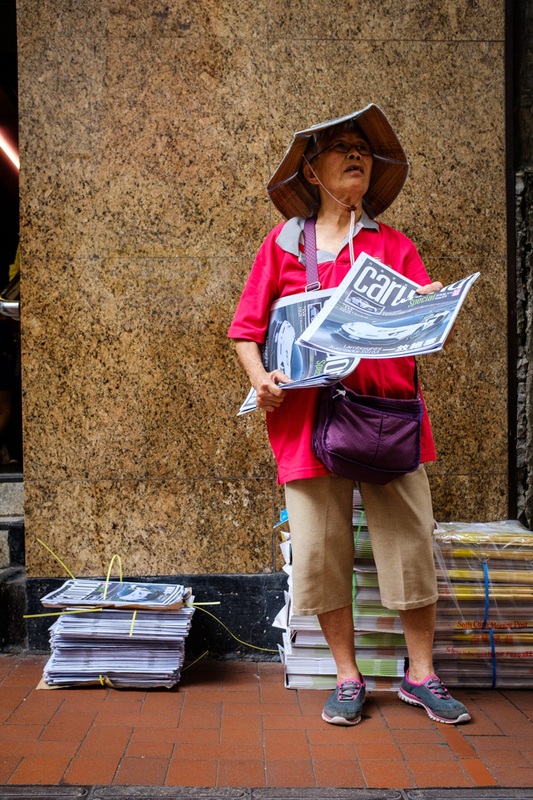 Like in virtually every country I’ve ever been to, there are dozens of free newspapers in Hong Kong. Well, they’re called free newspapers, but like everywhere else, they’re really just a free collection of adverts. More interesting to me was the guy peddling them, and particularly his hat. When it’s really hot and sunny here, those working out in the sun often wear hats lined with a reflective surface, to divert as much heat as possible I suppose. It certainly makes their look funky! 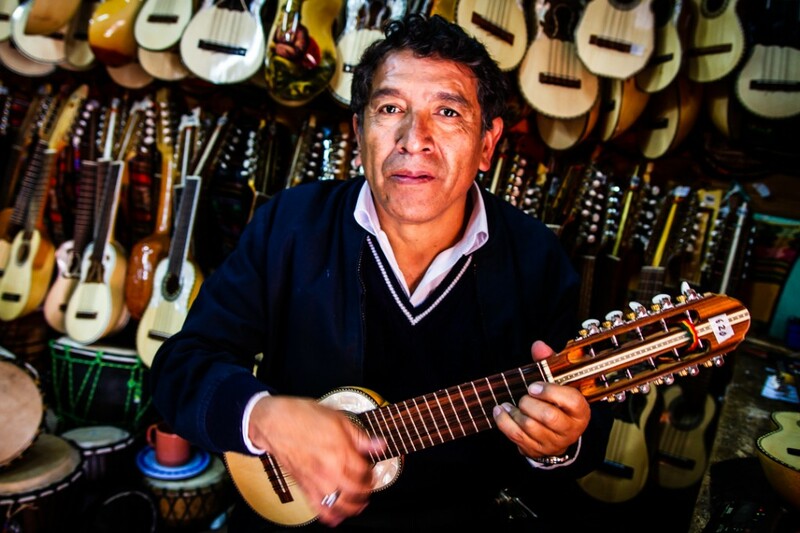 The charango is a wonderful little guitar like instrument with lots of strings for its body size. I wanted to buy one in La Paz for my son who plays guitar, and so walked into this store. I asked the salesguy if he would demonstrate the sound differences between the various models, and he seemed more than happy to be photographed in the process. I read somewhere that when the Spanish arrived in South America the Inca had over 50 species of fruit and vegetables they commonly ate where the Europeans fared on 4 or 5. We forget it too easily, but tomatoes, potatoes and many of our modern food comes from South America. In Copacabana there was a wet market with dozens of varieties of potatoes I had never seen, and the widest range of crisps (corn, potatoes and probably much else besides) I had ever seen. 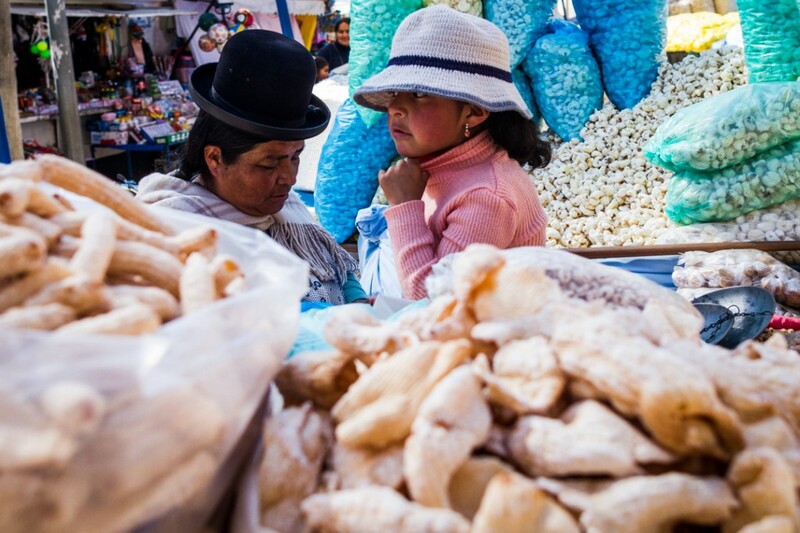 I even bought a sack of corn crisps to bring back to La Paz! In French circus fiction (is that a thing?) the ringmaster is often called Monsieur Loyal (Mister Faithful). Apparently, like many such things, the name derives from Anselme-Pierre Loyal (1753-1826) who was a famous ringmaster and circus manager. 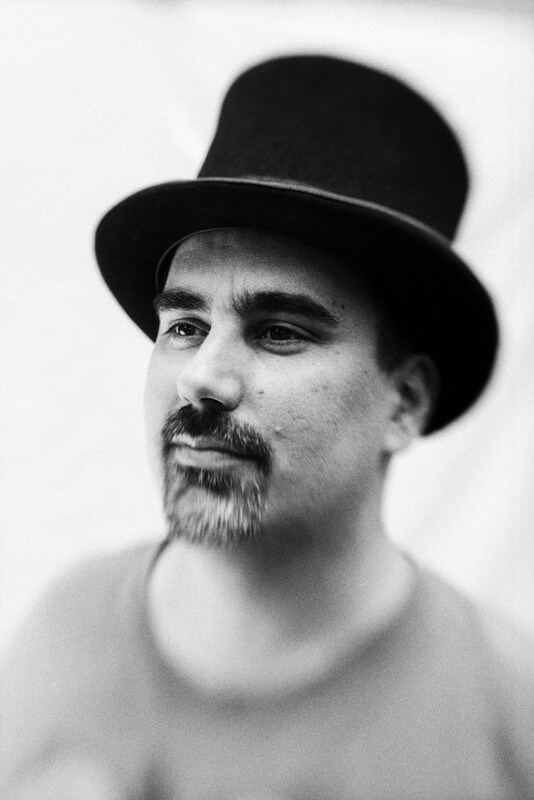 The top hat and the moustache are part of the trademark look, and Thomas here has the former, and the lensbaby makes his goatee half blurred, which give the illusion of a moustache. Hence the name for the photo. 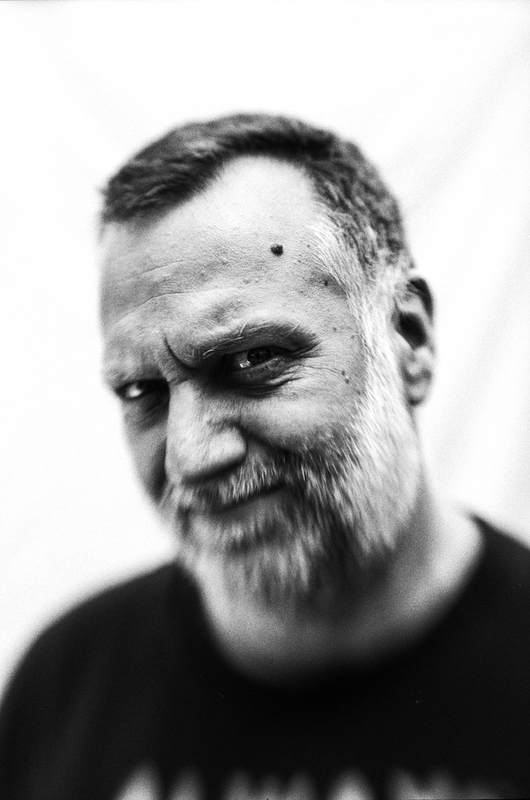 I don’t often shoot self-portraits, and when I do, it tends to be because I’m experimenting with something, lighting or framing. But this is technically not exactly a self-portrait although I planned and set it up, someone else framed and pressed the shutter. Still, I like the photo, so I’ll attribute half of the paternity to myself and show it nonetheless.